UNESCO/IOC operational requirements for Regional Tsunami Service Providers (RTSPs) include the linking of earthquake and tsunami forecast information with local hazard and risk assessment and inundation models through National Tsunami Watch Centers (NTWCs) to provide coastal inundation forecasts for threatened communities (Tsunami Service Level 3). 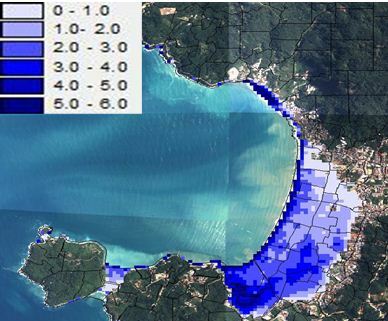 Inundation forecasts are useful in guiding preparedness activities, such as evacuation and mobilization of response resources for a tsunami emergency, to longer-term preparedness activities, such as risk awareness, emergency preparedness planning, evacuation drills, etc. There have been a number of efforts on tsunami risk assessment by various external institutions; however, a key gap in these efforts has been capacity building of partner institutions in risk assessment tools. RIMES plays a key role in the region providing capacity building to Member States in end-to-end early warning. RIMES works with regional and global centers in developing low-cost technologies for tool development, provides a test bed for testing these tools for operational applications, transfers these technology and tools to Member States, and trains technical/ operational staffs in tool application.